We are very exited to welcome Dr Sophie Pitman to Refashioning the Renaissance team. Sophie joins us from the Columbia University, where she worked as a postdoctoral researcher at The Making and Knowing Project. 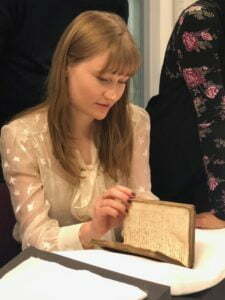 Her doctoral research, conducted at the University of Cambridge, focused on making, wearing, and owning clothing in early modern London, and she is interested in reconstruction as a methodology for historians, and collaborates with makers and museums. In Refashioning the Renaissance, Sophie leads the experimental work of the project. To read more about Sophie and her work, see our People page.